Sekiro: Shadows Die Twice [Activision] – Ouch That Hertz! Sekiro: Shadows Die Twice is an absolute masterpiece of a game. From Software, who is best known for Bloodborne and the Dark Souls series, has created a world that is not only a gorgeous sight to behold, but an even deadlier place to explore. Director Hidetaka Miyazaki and publisher Activision transport the player to the world of 1500’s Sengoku Japan. For you history buffs, this era in Japanese history was filled with heavy military conflicts, which makes it one of the deadliest time periods in Japan’s history. So what makes this a game that deserves such high praise? Let’s slash into the meat of it and see! The player is put into the role of a stone-hearted Shinobi named Sekiro. 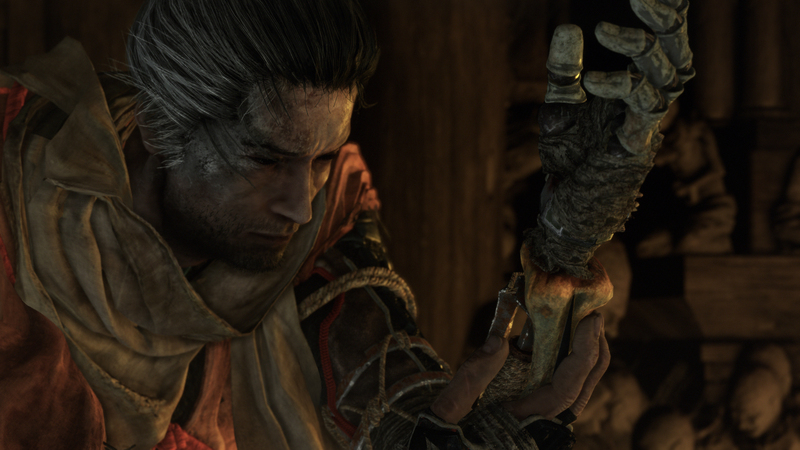 Sekiro is on a mission to save his master – a young lord who is the descendant of an ancient bloodline. The young lord is taken at the beginning of the game after the player has completed the tutorial. During the battle at the end of the tutorial, the protagonist’s arm gets severed and he is left for dead. When he awakens some time later, he is greeted by The Sculptor, who has taken the liberty to fit Sekiro’s missing limb with a prosthetic arm. The Sculptor goes on to inform the protagonist that as they explore the world, the player will find different prosthetics that can be fitted to their current arm to help gain an advantage in battle. The prosthetics range from a grappling hook that aids in traversal of higher locations to a flame barrel prosthetic that engulfs a foe with fire to even an axe prosthetic that is used to smash wooden enemy shields into splinters. Combat is quite different from Dark Souls and Bloodborne. As with the Soulsborne games, where most strategies were hit-and-run attacks, Sekiro’s combat is based on posture. Eliminated from the previous games also is the stamina meter and it is replaced by a posture bar that appears above an enemy’s head and, in turn, below the player. When the player successfully deflects and lands attacks, the posture bar fills. Once the posture bar is full or as the game calls it, “broken,” a red sphere will appear on the enemy’s body. The player can then execute a Shinobi Deathblow. A Shinobi Deathblow will cause a massive amount of damage up to and including death. Stealth kills will also result in Shinobi Deathblows if the player is quiet enough to sneak up on an unsuspecting enemy. On the other hand, not all Shinobi Deathblows are instant kills. When the player engages stronger enemies, red circles above the enemy’s health bar appear. These bars indicate how many times one needs to deplete that enemy’s health bar. Delivering a Shinobi Deathblow to one of these enemies will not instantly kill them but it will eliminate the rest of the current circle above the enemy’s health. Because of the advantage Shinobi Deathblows provide, it is always a smart strategy for the player to find a way to break the enemy’s posture. The only major issue with the combat is the camera. There were times that while locked-on to an enemy, the camera would focus solely on that enemy and until the player released the lock-on, there was no way to see who was hitting them. With how hard enemies hit in this game, this could leave the player using items to regain health a lot sooner than expected or otherwise facing an untimely death. Speaking of death, in Sekiro: Shadows Die Twice, be prepared to die and to die a lot. However, this is not unfamiliar territory when it comes to From Software games. Luckily though, in Sekiro, death is not the end. Upon dying, the player has a decision to make: either stay dead and respawn at their last checkpoint, or resurrect right there. The player will not gain all their health if they choose to resurrect, but a good amount does reappear. If they are killed again, there is no other option than death and they will respawn at their last checkpoint. 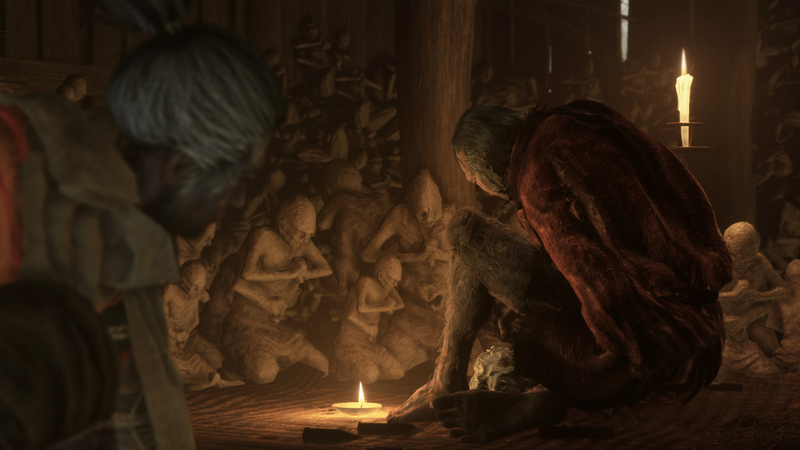 At that point, everything from experience to money is halved unless the gods and Buddha grant Sekiro Unseen Aid. This is a random blessing that allows the player to keep all experience and money that was collected. There is a twist though: if the player chooses to keep resurrecting themselves, it will cause a disease to be released on NPC’s called Dragonrot. The more Dragonrot Essence that is around, the less likely it is that the player will receive Unseen Aid. There is definitely a balance of deciding if it is worth resurrecting and continuing the fight or just dying and restarting the area. There are no shields, equipment, or weapons to upgrade and in fact, there is not even a leveling system in the traditional sense. Sekiro is presented with and will use the same katana he receives at the beginning all the way through to the end. So how does he become a stronger Shinobi? By unlocking skill trees. Skill trees can vary from Shinobi Arts, Ninjitsu and Prosthetic Tools. The experience gained from killing enemies will fill a bar that will award the player with a skill point when filled. 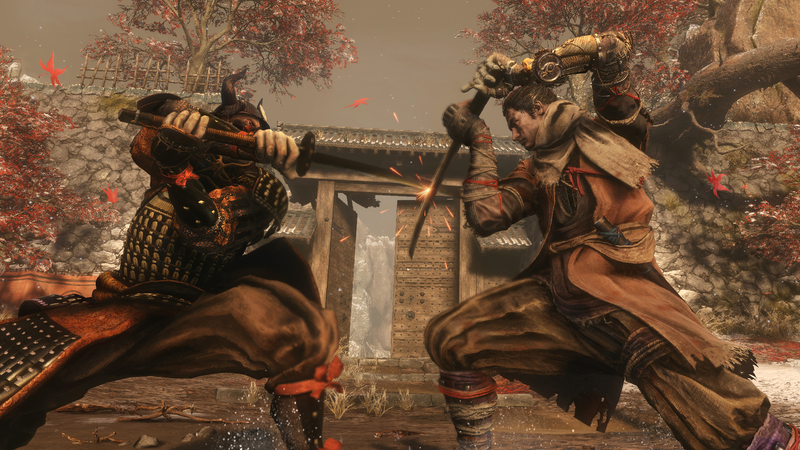 Skill points can be redeemed in the skill trees, allowing the player to build the type of fighter they would like Sekiro to be. Sekiro: Shadows Die Twice is a game that, in simplicity, is about patience yet it is the hardest element to master. I can say that if you are looking for a game where you, as a player, just want to rush at the enemies “Leroy Jenkins-style” and get into a sword swinging battle, you will lose and you will lose fast. Enemies hit hard and when I say they hit hard, I mean they hit HARD. The player’s patience will be key to recognizing an opening and going for it. Showing restraint and knowing how many attacks the player is able to execute is crucial to being successful in this game. There were plenty of times when I had an enemy nearly defeated only to be met with a grab or swift swing of their sword and it was game over for me. Although the difficulty factor is there and the penalties might seem unforgiving, never once did I not want to return and try again. Sekiro makes the player think “What is the best route for me to take?” Strategies may differ from player to player and both players could still be successful. The game does not fault players for thinking outside the box and entices them to try new things, new techniques, or modify strategies. And just when the player thinks he or she has mastered the timing or dodges, rolls and deflections, Sekiro: Shadows Die Twice introduces a new boss that requires the current strategy to be tweaked. Not once during my playthrough did I feel that I was just rehashing a previous boss battle. With that said, some of the mini bosses felt similar, although not enough to the point where it was an issue.